Finding your voice does not only apply to artists or musicians or writers. Once, I sat in on a recording session with a friend of mine who works as an artist and musician and record producer in Nashville. “Their voices were so affected,” said the lead singer of the band my friend was recording. He was recounting the words of a famous rock producer he’d met for lunch some years earlier. The famous rock producer had lamented his failed efforts to get the lead singer of an emerging rock band to record a good vocal track. I sat there in my friend’s studio listening to this story and it hit me. “Affected,” I whispered to myself. It’s almost impossible to live life unaffected by the world. So many things roll into our lives. And, like the ocean’s tide, they crash in, and move out, each time, moving more and more of our shoreline away. Is there any way to live unaffected by the influences of the world? Think about the lament of the famous rock producer. When you and I hear a unique singing voice, we know right away. We love it because it possesses something so real, we almost can’t explain it. In today’s world, we call this “realness” authenticity. But I don’t want to use that word because it comes fattened with philosophical baggage about which I haven’t the time to complain. The realness I’m referencing you and I intuitively recognize. It draws us in. We feel as though we’re hearing from the person’s soul. Does someone’s voice come to mind for you? For me, it’s Eddie Vedder, the lead singer from the band Pearl Jam. I can remember where I was when I first heard the song “Even Flow,” one of their all-time great songs, and a modern classic. I was driving my 1984 Chevy Luv pick-up, headed back to what became my last partial semester at Liberty University, but I had to pull over. “Who is this?” I remember muttering to myself. That voice. Raw, gritty, passionate, baritone. It wasn’t long until every other singer in the modern rock genre began mimicking Vedder’s earthy baritone. When smart industry people find a successful formula they mimic it. And that’s natural. The music industry is a copy-cat industry. At least that’s what my musician-artist-producer friend told me. I know I tried to mimic Vedder. I was in a band for nearly seven years. During our early grunge-infused years, the list of our influences read like a Seattle band popularity contest: Eddie Vedder, Layne Staley of Alice in Chains, Chris Cornel of Sound Garden, and Kurt Cobain of Nirvana. I wasn’t a baritone, like Vedder. So I didn’t mimic that aspect of his voice. I was drawn to the passion and grit. It resonated with me. I felt like some of that was already in my voice. When I listen back to some of our band’s recordings, I can hear the affectedness in my voice. I can hear Vedder in places. But then, I hear my own voice peek out. “Ah, there I am,” I say, lifting my rock fist high in the air while driving my truck. The Affected Voice Syndrome or AVS (something I just made up) also exists in the writing world. When I began my full-time writing career in 2005, I wanted to write like my favorite authors: George MacDonald, C.S. Lewis, Frederick Beuchner, Annie Dillard, James Joyce, T.S. Eliot, Ernest Hemingway, I could go on. It wasn’t intentional on my part; just a natural tendency I discovered when I’d finish a writing project. I noticed their voices drizzled all over my prose. I also noticed elements of songwriters in my scribbles. I had to get it out of my system. I’m still, to some degree, getting it out of my system. After I published my first book, which I co-authored with my best friend, I noticed my affected voice fading away and my own voice scrambling to the surface. It was also during that time of discovery the blog world blew up. The original bloggers landed book deals and speaking engagements. I remember one blogger in particular: Ann Voskamp. I don’t know Ann, but I know Ann’s voice. Who doesn’t? When Ann’s book, One Thousand Gifts, exploded, and her blog entered the stratosphere, I noticed many female writers adopting Ann style-points. And her influence continues. Again, this is natural. Ann is to them who Eddie Vedder or Frederick Beuchner were to me. 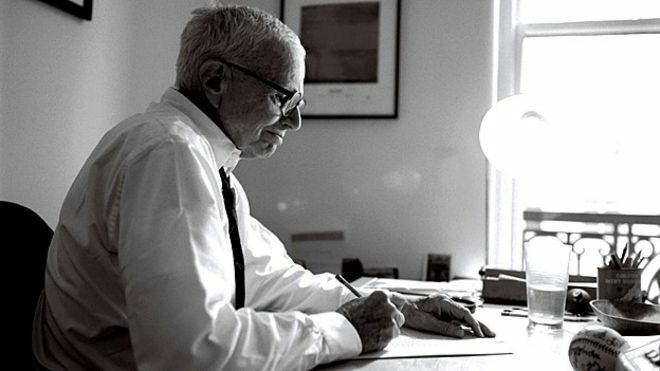 William Zinsser, author of the best-selling classic On Writing Well, recounts how he imitated his favorite writers for much of his early career. It wasn’t until he was in his mid-fifties and his wife encouraged him to turn his Yale course on writing into a book, that he discovered his own style—another term for voice. Before that moment his writing took on the voice of the person he wanted to be perceived as; a youthful, witty critic. Once he shed AVS (see above), he found his voice. I like how Zinsser explains what he learned about finally developing his own voice. He realized how, for years, he tried to write like the famous essayist E.B. White. He also tried to be E.B. White. But when he stepped away from this infatuation with White, he saw himself, unaffected. He saw a person who loved to participate in the world, a teacher who valued the interaction with his students. He was warm and encouraging. And that’s who he wanted narrating his book. Himself. The unaffected self. That’s the goal, right? And yet I need to issue a word of caution here, because in our modern world embracing your unaffected self means something different from the idea I’m getting at. This unaffected self can easily be turned into a me-monster bent on satisfying, well, me-myself and I.
Zinsser, in his wisdom, also addresses this in a short essay in which he gives every reader permission to write their own story. His permission comes with a caveat: the writer must abide by the unwritten code of modesty. Because in our age, shame has left the building, he says. Every inch of a person’s life is fair game. In fact, you’re encouraged to share your most squalid acts—the finer the detail, the better. Reality television, news, social media, they (we!) eat it up. Sounds like book topics from the Christian self-help section of a big box store, doesn’t it? Zinsser reminds us the memoirs that last, like Angela’s Ashes, work through the muck to get to the universal topics of love and forgiveness. When I mention the unaffected self, I’m not talking about this kind of unfiltered, unchecked, whiny wallowing, described so well by Zinsser. Rather, I’m envisioning you and me finally standing naked before God, okay with our shortcomings and failings and muck, because we’re standing in the brilliance of glory. And in that glory, you and I don’t see the muck. We see ourselves as God sees us. Drenched in his presence. Isn’t this picture similar to what the Apostle Paul is getting at when he talks about casting off anything that hinders his pursuit of Christ? It’s a Greek picture of a naked runner sprinting unencumbered to the finish line. The runner runs unaffected. No AVS. I’ve taken a spiritual turn here. But as I reflected on this idea of “unaffectedness” it made sense to me both as a writer, and as a person. If I’m dishonest and affected as a writer, I’m probably searching for my own voice as a person as well. Zinsser’s self-discovery excites me to be me. The me God made me to be as his child, standing in his gaze, communing with him. Not the bent-in-on-myself-me that our world—even the Christian world—loves to promote. Zinsser’s story arms me with three important reflections as I continue along my pilgrim way as a writer and a person. First, his story inspires me to stop comparing myself to others, and to listen to God’s voice—the only one that matters. When Zinsser discovered his own voice, it changed his life. The discovery breathed new life into his writing, gave him a new-found confidence in his ability, and provided him the strength to cast off the influence of those writers he admired. Second, I must cultivate spiritual awareness. If I’m banging through life without taking the time for reflection and self-evaluation, how will I ever realize the extent to which the world affects me? The jewel of the spiritual life is intimacy with God. What does intimacy with God look like? A Christian who lives as if God’s existence and companionship is reality. Perhaps. But I believe you and I must revive the orthodox mysticism A.W. Tozer defined and practiced. Orthodox Christian mysticism doesn’t need to entail strange theological sounding words from medieval times, or odd practices that require incense and candles, or living as a recluse. Christian mysticism, simply stated, looks like a Christian who lives in close relationship with God through his Son, Jesus Christ. When I am close to God, I’m closest to my true self and finely tuned to the pressures and affectedness of the world. Finally, Zinsser’s story challenges me to cast off my AVS. When you and I cast off the expectations and pressures of the world we can walk our unique path, unencumbered, once again. When I experienced freedom from AVS, it was as if I woke to a new spiritual reality in my personal relationship with God. This new freedom, however, does not imbue me with unchecked hubris. It frees me to joy in who God created me to be, yes. But such freedom should also create meekness. When Jesus said the meek shall inherit the earth, he was not suggesting that you and I become weak and feeble-minded Christians. In the ancient world meekness was often associated with a horse. A meek horse was one that obeyed its rider. Imagine the race horse or war horse in all its strength, speed, and glory. Unbridled, it runs wild. But when it comes under the careful guidance of the rider, all that strength, speed and glory are used for a specific purpose. When I cast off my AVS and draw close to God and submit myself to his careful guidance, he takes the reins and I fun free. It’s a beautiful paradox. Running free requires not a filling of confidence for the journey ahead, but an emptying. I believe this concept of emptying needs revived in the Christian community because it is primary to the Christian life. And yet so much of contemporary Christian culture looks like the opposite of emptying: self-promotion. I’m convinced we desperately need a renewed sense of what it looks like to live a life in which we empty ourselves and view ourselves not as self-effusive mini-gods. But as saints eager and content with God’s gifts to us. What you and I receive from our experiences in life, along with the insights gained by participating with the natural world, come to us from God. We do not work in the world as co-creators with God. That is theological hubris. “We are creatures who derive from God a wonderful ability to make something of what God has given us.” We live as recipients of God’s gifts to us. We shape our voices with God’s wonder. We churn the soil of God’s beauty. All under the careful tug of the reins by our Heavenly Rider. I’t took Zinsser half of his life to find his voice. And I find that for me, it’s an ongoing journey. Parts of me finally falling away revealing my true self, my unique voice. What does this sketch of the unaffected self look like? The heaven focused orthodox Christian mystic riding under the eternal twilight of our Glorious Heavenly Rider. I’m excited for this new 12-Week Devotional Video Series from my friend Lacey Sturm. You can try it before you buy it. It’s well done, thoughtful, inspiring, and insightful. Charles Caleb Colton, Lacon, Or, Many Things in a Few Words: Addressed to Those Who Think (S. Marks, 1824), 114. A. W. Tozer, “Introduction” in The Christian Book of Mystical Verse: A Collection of Poems, Hymns, and Prayers for Devotional Reading, Reissue edition. (Chicago: Moody Publishers, 2016), 16. Lewis Hyde, The Gift: Creativity and the Artist in the Modern World, 25th anniversary ed. 2nd Vintage Books ed. (New York: Vintage Books, 2007), 189. Teresa of Avila, Let Nothing Disturb You, compiled by John Kirvan (Notre Dame: Ave Maria, 1996, 180-181. William Zinsser, The Writer Who Stayed, Reprint edition. (Philadelphia: Paul Dry Books, 2012).